Tomorrow, at 11am CET, the MotoGP Court of Appeal meets to consider the case of Ducati's swing arm spoiler, fitted to all three Desmosedici GP19s raced at the opening MotoGP round in Qatar. Three trained lawyers are to hear the case put by Aprilia, Honda, KTM, and Suzuki, that Ducati's spoiler breaches the technical guidelines set out by MotoGP Technical Director Danny Aldridge. The Court of Appeal is hearing the case after it was rejected twice on the Sunday evening of the Qatar race. The FIM Stewards first rejected the protest submitted by the four manufacturers against Ducati, which the four manufacturers appealed to the FIM Appeal Stewards. After hearing evidence, the FIM Appeal Stewards decided more expert evidence and background data was needed to make a decision, and so referred that decision to the highest court inside the FIM, the FIM MotoGP Court of Appeal. At the heart of the appeal is the belief that Ducati's spoiler creates an aerodynamic downforce. This is a violation of the technical guidelines issued by Danny Aldridge during preseason testing, which banned aerodynamic parts being attached to the rear swing arm unless they were being used to deflect water, protect the tire from debris, or cool the rear tire. The guidelines were in response to the parts used by Ducati at the Qatar MotoGP test, with the spoiler attached to the bottom of the swing arm, and two wheel covers used on the bottom of the front wheel. You can find a complete analysis of the dispute here, written on the Monday after the race. On the face of it, the argument that the spoiler creates some kind of aerodynamic force appears to have merit. From this photo, by Tom Morsellino of OffBikes, it is clear that on the interior of the spoiler, there are three transverse vanes, which could provide some kind of downward pressure. That is certainly what F1 aerodynamicist Ali Rowland-Rouse believes, as he told Motor Sport Magazine's Mat Oxley. However, it is equally likely that the vanes help to cool the rear tire in some way or another. That is what Ducati insists it does, as Ducati's Sporting Director Paolo Ciabatti told me on the Sunday night of Qatar. 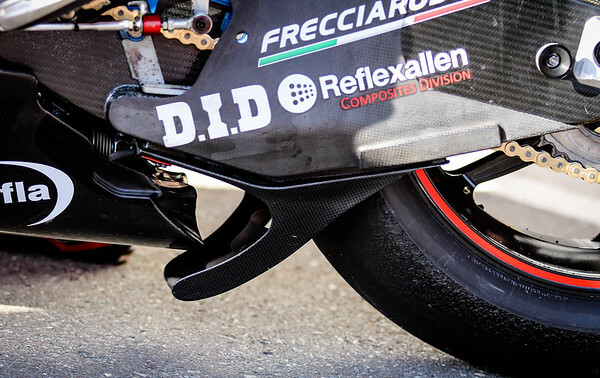 That, Ciabatti said, is why Danilo Petrucci and Jack Miller used the parts first, because they suffered the most from overheating the rear tire due to their size and riding styles. Ducati have data which they say proves that the temperature of the rear tire is lower when the part is fitted. This is what makes the question before the Court of Appeals so complicated. Ducati's data will almost certainly show that the temperature of the rear tire drops when the spoiler and front wheel covers are fitted, but that does not necessarily mean that this is a result of the air being channeled onto the tire by the spoiler. If the spoiler helps keep the tire on the asphalt and reduces wheelspin, this can reduce the temperature of the tire. It may even be that the spoiler does produce downforce, but only a fairly small amount, and that the main effect of the part is to reduce rear tire temperature. If the primary function of the spoiler is to reduce tire temperature, but the part also produces downforce as a secondary effect, does that violate the technical guidelines? Though the Court of Appeal is made up of lawyers, they have the ability to enlist experts as witnesses in the hearing. Given the complexity of the case, this would seem the advisable course of action. Understanding whether Ducati's spoiler violates the rules will require deep and specialized knowledge. The problem remains, however, that the Court will also be forced to rely on data provided by Ducati. Only Ducati have all of the data pertaining to the function of the spoiler. The temperature data recorded by the tire temperature sensors and data logger may well show a drop, but that is not the whole story. Computational fluid dynamics (CFD – basically, airflow) simulations would paint a more complete picture of the function of the spoiler, but only Ducati possess the actual data required to prove the case one way or another. Any simulation run by rival factories must by necessity be based on an approximation of the dimensions of all of the parts. And in fluid dynamics, even tiny changes can make a huge difference, as anyone who has ever been confounded by the front wing of an F1 car can attest. Three paths lie ahead once the judges in the Court of Appeal make their decision. If the Court finds in favor of Ducati, and reject the appeal, then the four factories – Aprilia, Honda, KTM, Suzuki – may decide to drop the case altogether, and try to bring the subject up within the manufacturers' association, the MSMA, and call for tighter controls inside the Grand Prix Commission. Alternatively, the four manufacturers may want to carry on their appeal, in which case they can take their case to the Court of Arbitration for Sport. The CAS may end up not hearing the case ahead of the next round in Argentina, leaving Ducati to use it in the following race. If, on the other hand, the MotoGP Court of Appeal finds in favor of the four factories, and rule Ducati's spoiler illegal, then the fate of the case lies with Ducati. In that case, it is Ducati who may choose to appeal to the CAS. Ducati would be barred from using the spoiler until the CAS had heard the case. What effect will the judgment of either the Court of Appeal or the CAS have on the result of the Qatar race? In theory, the Court of Appeal can impose any penalty for the infringement of the technical rules, including disqualification of all three Ducati riders who used it – Andrea Dovizioso, Danilo Petrucci, and Jack Miller – meaning a loss of points in the rider, team, and manufacturer championship standings. In reality, that would seem unlikely. Ducati had enquired about the rules, and Danny Aldridge had not ruled the spoiler illegal. A more likely ruling would be to leave the result of the Qatar race intact, but ban any further use of the spoiler. That would mean that Andrea Dovizioso would keep his win, and still be the leader in the championship. That is the solution proposed by Aprilia Corse CEO Massimo Rivola, speaking to Italian magazine Motosprint. If the Court of Appeal felt that Ducati needed to be punished, they could potentially choose to take away either team or manufacturer points from the Italian factory, leaving Dovizioso as the winner of the Qatar race, but leaving Ducati with zero points in the manufacturers championship. Whatever the eventual outcome of the case, and whether it goes to the CAS or not, the existing structure of the MSMA seems permanently weakened. In previous years, friction between MotoGP's manufacturers was kept to a minimum, the MSMA managing to present a united front against the FIM and Dorna in the negotiations over contracts and technical rules. That has grown more difficult recently, as the success of Dorna's new rules has brought new manufacturers back into the series. When there were just three or four factories in MotoGP, three of whom were Japanese, agreements were quickly reached. The process was made even easier by the other Japanese factories treating Honda as the senior partner, sources with knowledge of the system have explained to me in the past. Three things have happened to change that. One factor has been the return of Suzuki, Aprilia, and the arrival of KTM to MotoGP. The MSMA now has six members, where once it only had three. What's more, there is a split between the Japanese and European manufacturers, as the two very different cultures clash. Though Honda, Suzuki, and Yamaha all have Europeans at the head of their sporting operations, the racing departments are all led by Japanese staff, with a very different corporate culture to the European factories. Added to that is the split between the flatter, less hierarchical culture inside KTM, and the more formal cultures of the Italian factories Aprilia and Ducati. Managing all of these tensions is difficult. The clashes of culture and approach make it harder to find consensus between the factories, but the simple number of participants is a huge problem in and of itself, as anyone who has tried to split a restaurant bill between a large group of people can say. There are now more competing interests inside the MSMA, and they are harder to reconcile. This issue is made more complicated by the disappearance of a common enemy. The massive change in the rules has shifted the dynamics inside the MSMA as well. Where previously, the factories stuck together in trying to hold off Dorna's attempts to impose spec electronics, losing that battle has left them with less to unite them. The MSMA lost the war over spec electronics when the grid shrank to 17 bikes. That leaves them with less to defend, and more avenues open to explore. To an extent, it has also left them with extra budget they cannot spend on electronics, and the natural creativity of engineers is opening up new areas of motorcycle dynamics for them to experiment with. The closeness of the racing means that even small gains can be the difference between winning and losing: after all, Valentino Rossi finished 0.6 seconds behind the winner Andrea Dovizioso in Qatar, yet was still only fifth. So when one factory finds an area in which they believe they can find an advantage, they invest a lot of time and energy in trying to exploit that to the maximum. That leads to complaints from other factories that they are being forced to spend money on the same thing, in an attempt to keep up. And that naturally leads to conflict. Finally, there are the personalities involved. Gigi Dall'Igna was brought into Ducati with the express mission of trying to win a MotoGP championship. Dall'Igna has left no stone unturned in pursuit of that objective since his arrival, and has clashed with the other factories on more than one occasion. His tenure at Ducati kicked off with him deciding after the Sepang tests that the Italian factory would make use of the extra concessions allowed in the Open Class, which replaced the CRT. That triggered a crisis in the MSMA, and a rewriting of the rules, introducing a split between factories which had won a race, and factories without, which would be allowed extra concessions. At Aprilia, Massimo Rivola arrives from F1, a series where the teams are constantly set against each other, and an arcane set of rules means that protests are commonplace. Though Aprilia are only one of four factories to complain about Ducati, they have been vociferous in their complaints. KTM and Honda have complained about Ducati before, but for the most part, their complaints have been restricted to the media. It is striking that an official complaint only occurred once a former F1 boss joined a factory. Tensions inside the MSMA weaken the manufacturers, and that is bad for the sport. Without the ability to form and present a united viewpoint, the MSMA loses its control over the technical regulations in the sport. That leaves it in the hands of Dorna, IRTA, and the FIM, who have much less technical expertise than the factories, despite the addition of Corrado Cecchinelli as Director of Technology. As the factories explore new avenues of development, only they have an idea of the costs involved, which makes regulating that much more difficult. In a way, the Ducati spoiler episode also illustrates this point. Danny Aldridge may be steeped in MotoGP technology, but he would be among the first to admit that he is on shaky ground when it comes to the extremes of aerodynamic technology. Aldridge and his staff are trying to address the challenges of aero R&D as best they can, but are running into exactly the same problems which F1 does: any attempt at descriptive regulation immediately and inadvertently opens up loopholes which factory engineers, poring over the rules with a fine-tooth comb, are all too eager to exploit. Ducati's spoiler is a perfect example. Ducati started using wings, an example which others were quick to copy. To prevent the costs involved in aerodynamics spiraling out of control, rules were introduced defining 'Aero bodies' as consisting of the fairing and the front fender. Ducati noticed the gap, and inspired by Yamaha's swing arm-mounted water deflector debuted last year, investigated attaching a spoiler to the bottom of the swing arm. How do you prevent that? As soon as you try to define what is and what isn't allowed, the engineers take that as permission to start experimenting with all the parts which didn't get a mention in the rules. Like nailing jello to the wall, any illusion of stability is temporary, and ultimately illusory. There are no quick fixes. So whatever the outcome of Friday's MotoGP Court of Appeal hearing, this is just the beginning. Like electronics, aerodynamics are difficult to control, and a potential money pit where every additional dollar spent can provide a small but marginal gain. And like electronics, aerodynamics offer potential benefits for road bikes as well. Clever aero can help reduce fuel consumption, reduce vehicle noise, and improve the way the bike reacts and behaves, adding stability at speed while making it more manageable in the corners. "If you consider aerodynamics and vehicle dynamics together, the cooperation of these two areas is very helpful for us in understanding and judging all the different configurations we are testing and investigating, while developing the bike," said Edoardo Lenoci, Ducati's Aerodynamic Development Manager, at Ducati's 2019 MotoGP launch. Lenoci moved to Ducati from F1 six years ago. There is much to be learned from aerodynamics, but it also presents innumerable headaches ahead. Gathering the background information for detailed articles such as these is an expensive and time-consuming operation. If you enjoyed this article, please consider supporting MotoMatters.com. You can help by either taking out a subscription, by making a donation, or by contributing via our GoFundMe page. You can find out more about subscribing to MotoMatters.com here. A previous version of this story incorrectly stated that factories appealed the decision of the FIM Appeal Stewards to the FIM Court of Appeal. The Appeal Stewards decided to refer the case to the Court of Appeal, feeling it needed much more evidence on which to base a judgment. Once again, an insightful article. Thanks for the insight into the MotoGP ethos, David. I have read sufficient bluster and/or hype: It is interesting to understand how the MSMA does and does not fit into this new twist. It is ironic that a sports series that is explicitly intended to push envelopes of technology and forward-thinking is beginning to regress into litigous squabbles. Let us hope MotoGP does not become F1 with two fewer wheels. Maybe a swingarm spoiler could help Yamaha's M1 with their traction woes. Yamaha inspired Ducati's rear tire cooler. Something similar might work for them. Interesting to read Gigi's comments in an interview with David Emmett " Yamaha now has a proper engineer to manage this "..." to try to understand what happens on the tire"
Hoping the Yamahas will go better in Argentina. I think there's a fair chance of it coming out in Ducati's favour. It'll either not generate downforce through something clever like stalling air flow or there will be a loophole in the guidance, as far as I'm aware this document hasn't been released.